Happy Wednesday everyone. How has your day been so far? 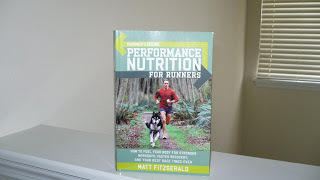 This is an excellent book to have in your library, you don’t have to be training for a marathon to enjoy this book, your love for running or being active is all you need. Two chapter titles included are : Pre-race nutrition information and Recovery nutrition and more. 1. Leave a comment stating why you would like to have this in your library. 2. Or email me your comment. 3. Link back to this post on your blog and let me know. You have until midnight Wed. Sept 16/09. The winner will be announced Thursday Sept. 17/09.